Since "Can I still upgrade to Flawless", http://www.mortalkombatonline.com/content/forum/showmessage.cds?id=160004 was closed due to users complaining about certain functions of the site and its current overall state (which was, ultimately, off-topic), it was obvious that the time is right for an on-topic discussion dedicated to whining about MKO's problems. Of course, complaining about MKO is the golden example of "If a tree falls and no one's around, does it make a sound? ", but one makes the best of one's situation. Don't "drive-by" this topic, share your thoughts today. <IMG src="http://wines.com/images/cabernet-sauvignon-glass.jpg" width="95%" <br/> <br/> <br/>Cabernet Sauvignon- <br/> <br/>The most popular of red wine grape varietals, its name Sauvignon derives from the word “Savage.” Cab is grown in just about every major wine making region. It’s produced as a single varietal and as a major blending component. <br/> <br/>Cabernet Sauvignon is deep in color, like raspberry, virtually impermeable to light. The varietal is often associated with oak, which in barrel is used to soften the tannins to make it more approachable. <br/> <br/>Good Cabernet Sauvignon benefits from cellaring several years to soften its tannins, which can be harsh in young Cabs, and bring out the complexity and rich flavors of the grape. 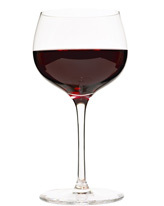 <br/> <br/>Cabernet Sauvignon is a full-bodied and an excellent food wine to pair with nearly any roasted or grilled or braised beef dish, steaks or burgers, duck and game birds, venison, rack of lamb, grilled or roasted lamb, cheese (especially aged blue and/or stinky cheeses), dark bittersweet chocolate and heavier dishes. The most popular of red wine grape varietals, its name Sauvignon derives from the word “Savage.” Cab is grown in just about every major wine making region. It’s produced as a single varietal and as a major blending component. Cabernet Sauvignon is deep in color, like raspberry, virtually impermeable to light. The varietal is often associated with oak, which in barrel is used to soften the tannins to make it more approachable. Good Cabernet Sauvignon benefits from cellaring several years to soften its tannins, which can be harsh in young Cabs, and bring out the complexity and rich flavors of the grape. Cabernet Sauvignon is a full-bodied and an excellent food wine to pair with nearly any roasted or grilled or braised beef dish, steaks or burgers, duck and game birds, venison, rack of lamb, grilled or roasted lamb, cheese (especially aged blue and/or stinky cheeses), dark bittersweet chocolate and heavier dishes.